Learn about the feature rich Monique bass and lead synthesizer created by German developer Monoplugs in this music tech spotlight. Monoplugs opened its doors to the music industry in 2010 with an aim to develop software instruments for professional musicians, newcomers, and hobbyists. Monoplugs founder Thomas Arndt and a team of creatives have so far created the Monique Synthesizer and B-Step Sequencer. 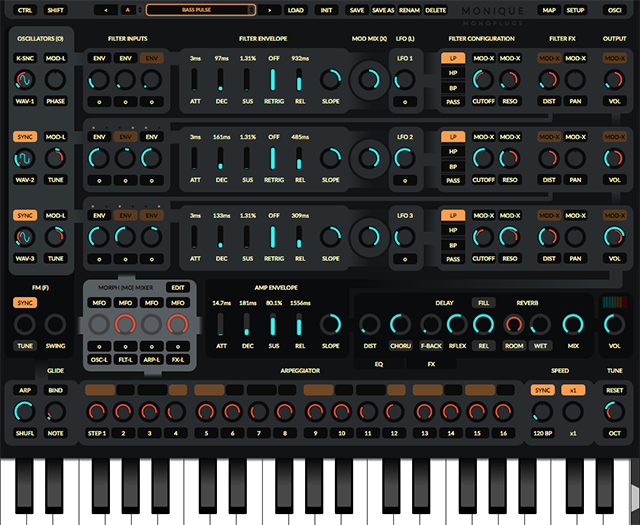 In this spotlight, we look at Monoplugs unique bass and lead synthesizer plugin, the Monique. Monique is a powerful monophonic, subtractive synthesizer designed to create unique bass and lead sounds that are perfectly suited for studio productions and live performances. Monique’s streamlined design features a large, freely scalable, multitouch user-compatible interface that avoids the use of menus for an enhanced workflow experience. There are also advanced options to adjust slider controls and speeds to your personal needs. This feature-rich synthesizer comes loaded with some brilliant capabilities such as a four-bar long loop function, a sixteen step sequencer, a custom morphing feature, a fun morph drag pad, and more. One of the standout capabilities of Monique is its morphing feature. Monoplugs incorporated a method of sound manipulation that allows you to mix between different parts of individual presets like a DJ. This incredibly flexible feature gives you the ability to control multiple parameters at once to evolve sounds in creative ways. Each morph group also has its own LFO to automate the morph mix, or you can have some hands-on fun using the morph drag pad to control the morph mix states. For example, you could use the four morph mixer controls to mix different oscillator values, filter values, arpeggiator values, and FX and EQ values over time for truly unique sound shaping possibilities. Check out the morphing feature in action below. The sound engine driving Monique’s power features three morphable oscillators that include one FM oscillator that can be routed through 3×3 analogue emulation filter tracks, an equalizer bank built out of seven resonant band filters, four signal destroying distortions, a selection of audio effects, and a heap of routing options. Learn more in the video below. Overview of Monique’s key features and technology capabilities. Pro and Demo versions available to download at Monoplugs.